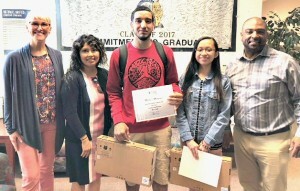 Twenty-eight Natomas Unified students received college scholarships or Chromebook laptop computers in May from the Natomas Schools Foundation, a nonprofit group dedicated to raising funds to benefit local students. Winners of $1,000 college scholarships were Dave Khalasi of Natomas High; Sophanit Getahoun, Inderkum High; and Rebekah Shiah and Kalliope Zervas, Natomas Charter. Six other students received $500 to help defray their college expenses: Bryana Castillo, Natomas High; Sara Brink, Raffaella Carrillo-Gomez and Lyndsey Tillinghast, Inderkum; and Tatianna Settanni and Madelynn Thomas, Natomas Charter. Applicants for the cash scholarships were required to have a cumulative grade point average of 2.5 or higher and, during the past two years, have served 50 hours or more in formal employment or volunteer service, which could include school clubs. A short essay about was required about lessons learned from that service. The Natomas Schools Foundation’s Chromebook giveaway, titled “NextGen Computer Grant Program, was designed for deserving youth in 5th through 12th grades who attend school within NUSD and need laptops to further their education. Winners were Christian Clark, Annette Contreras-Buenrostro and Lashea Dean, from Natomas High School; Chidinma Aniche, Michael Martinez and Lily Valdez, from Inderkum High; Shanina Thakur, NP3 High School; Zaiden Bush, Nevaeh Garcia, Ynaly Rivers, Natalie Sandoval and Niyati Sista, from Two Rivers Elementary; Aureliano Gutierrez Jr., Leroy Greene Academy; Anastacia Monroy, Natomas Middle School; Lamont Bufford Jr., H. Allen Hight Elementary; Elliott Gough, Natomas Charter STAR Academy; Akshaj Mehta, NP3; and Yahaira Ramirez, American Lakes. Applicants were judged on academic performance and potential, leadership potential, service to others, and a need for a computer to improve or maintain their academic performance. Much of the money for NSF’s college and Chromebook awards was raised in the group’s annual 5K community fun run – “Run For Their Future” – which will be held on April 27, 2019 at Inderkum High School. Donations to the foundation can be made on its website at natomasschoolsfoundation.org. © 2019 Natomas Schools Foundation · All Rights Reserved.